Our live updates for Cumbria have now finished for the day. We'll be back with more news, sport, weather and travel from 08:00 tomorrow. Hopefully, you can join us then. Until then, if you've got news or a picture you'd like to share with us, you can contact us on Twitter @BBC_Cumbria, by emailing us at cumbria.locallive@bbc.co.uk or on our Facebook page. Healthcare overhaul: What are the options for acute hospital services? The group that's been told to fix west, north and east Cumbria's struggling healthcare system has presented six options for acute hospital services to the regulator, the Care Quality Commission. They’re part of a 118 page report into the healthcare problems faced in the area, and possible solutions. Scenario 0 - Enhanced services at both Carlisle's Cumberland Infirmary and West Cumberland Hospital in Whitehaven. 24/7 Accident and Emergency at both hospitals – some emergency patients transferred directly to the CiC. Complex surgery in Carlisle but more low-risk surgery in Whitehaven. Consultant-led maternity, special care baby units and midwife-led units at both hospitals. Children’s inpatient wards at both hospitals. 24/7 Accident and Emergency at both hospitals - slightly more patients taken directly to Carlisle. Complex surgery in Carlisle and even more routine elective surgery in Whitehaven as an "elective centre of excellence"
Consultant-led maternity, special care baby unit and midwife-led unit at Carlisle. Midwife-led maternity unit in Whitehaven. Overnight children's ward in Carlisle with short stay children’s units in both hospitals. Complex surgery in Carlisle and routine elective surgery in Whitehaven as an "elective centre of excellence"
Consultant-led, midwife-led and Special Care Baby units in Carlisle. Overnight children's ward in Carlisle with short stay wards in both hospitals. 24/7 Accident and Emergency in Carlisle. 24/7 Urgent Care Centre in Whitehaven. No Accident and Emergency in Whitehaven. All maternity services in Carlisle. No maternity services in Whitehaven. All children's services in Carlisle. 24/7 Accident and Emergency in Whitehaven. 24/7 Urgent Care Centre in Carlisle. No Accident and Emergency in Carlisle. Complex surgery in Whitehaven and routine elective surgery in Carlisle as an "elective centre of excellence"
Consultant-led, midwife-led and Special Care Baby units in Whitehaven. Overnight children's ward in Whitehaven with short stay wards in both hospitals. A former director of public health in Cumbria says that questions still need to be answered following the conclusion of the Hillsborough inquests. The 96 fans who died as a result of a crush at the football ground in 1989 were unlawfully killed, according to a coroners' jury. Dr John Ashton was at the match in Sheffield and gave evidence during the inquests in Warrington. He said: "Today we've got a lot of the facts and the truth." "We still don't know how much involvement there was from the British Government, from Whitehall, but the important thing is that the main facts of what happened are agreed in a proper English coroner's court." Workington Reds travel to North East side Blyth Spartans in their Evo-Stik Premier Play-Off semi-final. "The boys have been absolutely superb this season." "I'm pleased that they've got something to show for their efforts." "It's all down to them...It'd been criminal if we'd had nothing to show for our efforts so credit to them for that"
The winners of tonight's game will meet Salford City or Ashton United in Saturday's final. There's full match commentary on BBC Radio Cumbria AM and online from 18:00. A man from Ulverston who's found fame for his fascination with the history of drain covers is the subject of a new documentary. Archie Workman was featured in the Dull Men's Club calendar for his "drainspotting". It followed an interview on BBC Radio Cumbria about his own calendar featuring the work he does maintaining roads near Ulverston as a lengthsman. Screen Three Productions are producing a film about him which they hope to take to festivals around the world. We've no problems being reported on the county's roads at the moment. There are roadworks in Milnthorpe on A6 Church Street between Park Lane and Main Street/Paradise Lane where temporary traffic lights will stay in place until 9 May according to Cumbria County Council. The group that's been charged with fixing north and west Cumbria's struggling health service says it will consider downgrading or closing hospital departments if necessary. In a 117-page report in response to the Care Quality Commission, The West, North and East Cumbria Success Regime says changes could be made to accident and emergency, maternity services and children's health services at either the Cumberland Infirmary in Carlisle or the West Cumberland Hospital in Whitehaven. The report also suggests that some community hospitals could lose beds. The CQC is considering its formal reply and a public consultation on the options will take place later this year. Thanks to BBC Weather Watcher woodieonthehill for this picture of a cloudy, but sunny, sky over Penrith. If you've got a photo of Cumbria you'd like to share, you can email it to cumbria.locallive@bbc.co.uk. Some of the junior doctors who are on strike from the Cumberland Infirmary in Carlisle are planning to give blood today as part of their walk out. They told BBC Look North's Megan Paterson that they'd be going to the city's Crown and Mitre Hotel where a donation session is happening today. There's more on BBC News about the effects of the strike action by junior doctors nationwide. A nature reserve warden will spend the next three months on an island in the Morecambe Bay with barely any contact to the outside world. It's the fifth year that Mike Bannister has worked as the seasonal warden at Cumbria Wildlife Trust's Foulney Island Nature Reserve near Rampside in Furness. He'll live out of a caravan on the reserve between from May until July where it'll take him a three mile bike ride to pick up supplies from the nearest village. Over the next three months, he'll monitor colonies of breeding birds on the nature reserve and generally maintain the reserve. 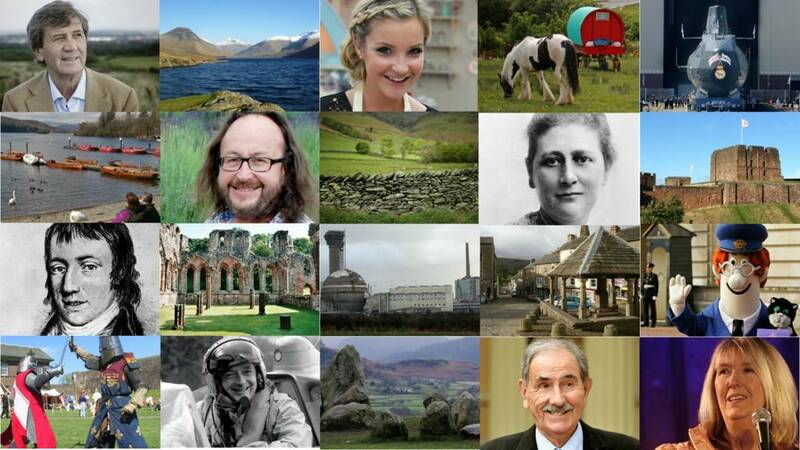 A woman from Cumbria is getting her picture featured on the BBC News England page. Each day, a picture is chosen to be part of the England's Big Picture gallery for the week. Lynn Hobbs took this photo at 15:30 while surrounded by Herdwick sheep at Wast Water in the Lake District. She said: "I had to pull in to let the shepherd bring the huge flock along the road next to the lake." The Labour MP for Barrow and Furness has denied swearing at MPs from the Scottish National Party in the House of Commons. SNP Glasgow MP Carol Monaghan said she was "outraged" by the language used by John Woodcock. She asked the Commons Speaker John Bercow for advice on how to make an official complaint about the Barrow MP. In response, John Woodcock said he had not used any offensive language and raised concerns that the SNP was using tactics of "intimidation" in the House. A teenager will sing out for Cumbria during a special ceremony in London's iconic St Paul's Cathedral. This afternoon will be cold and windy with sunshine and blustery showers. Those showers will get heavier in places with a chance of hail or thunder. Here's how the afternoon is looking in Keswick, you can find a detailed forecast for your area on the BBC Weather website. The company that hopes to build a new nuclear power station in West Cumbria says that an accident on the scale of Chernobyl could not happen now 30 years later. The accident in present-day Ukraine was the world's worst civil nuclear disaster. NuGen are consulting people in Cumbria about their plan to build a nuclear plant at Moorside next to the Sellafield site. "We didn't have it back in the 80s, it's fair to say." "These kind of issues came about because of a lack of regulation, a lack of transparency, and a lack of emphasis on safety." "That wouldn't happen in the UK, we have a very strong regulatory process here." A woman from Belarus who stayed with a Cumbrian family to recuperate following the Chernobyl nuclear disaster has thanked them for their generosity. Ceremonies are taking place in Ukraine today to mark the 30th anniversary of the meltdown which remains the worst nuclear accident in history. Karina Hyzova stayed with Nick Wilson and his family in Cockermouth when she was 8 years old. It was part of a charity-run programme to help children affected by the fallout from Chernobyl. "In our country, climate and social level is not as high as in Britain. For some children, [it was] the only way to go abroad and see different lives." "I've entered at university and got a degree of economics so now I'm getting another degree connected with my English." There'll be a special report about the candidates on BBC Look North at 18:30 tonight in the north of the county and on the BBC iPlayer. All five candidates will be in the hot seat on BBC Radio Cumbria this Friday between 09:00 and 10:00. Plans are on display in Ulverston for a new maternity unit at the Furness General Hospital in Barrow. Under the proposals, it will replace the existing labour and maternity wards with new ensuite accommodation and two dedicated operating theatres. The trust running the hospital has posted a video explaining the plans for the new unit. The new building is expected to cost 11 million pounds and members of staff from the trust will be answer questions about the changes at Ulverston Health Centre between 16:00 and 17:00 today. Thanks to BBC Weather Watcher Kev from Baycliff in the south of the county for this picture of the sun rising over the Morecambe Bay.